A few months from the start of the electoral process, the battle lines are drawn between a secularist and a religious party. Support for the latter is constantly growing. Not only could this lead to an increase in "unpunished" attacks against religious minorities, but it could mean that the economic boom in some parts of India could leave behind the countryside, where the vast majority of the population lives. India, the most populous democracy in the world, is preparing for its five-year rendezvous with democracy. In a few months, 800 million Indians will cast their ballot. This will be done over several days to allow security forces to move from one state to supervise the process. The Congress Party, which was in power at the federal government, seems to have little chance of being re-elected. In the recent Delhi Assembly elections, the ruling party lost to a new party, the Aam Aadmi (Common Man) Party, which came together as a groundswell of protest against corruption and inefficiency in government. The Bharatiya Janata Party (BJP), the Congress Party's traditional adversary at the national level, has quickly readied itself for the campaign by choosing Narendra Modi as its candidate. Modi has been re-elected as the chief minister of Gujarat for three times in a row, this in an economically promising state. The Congress Party has not yet picked its candidate for prime minister to avoid exposing itself to opposition criticism. It has opted instead to choose a prime minister after the election, but everyone knows that Rahul Gandhi is the likeliest choice. He is the son of Rajiv and Sonia Gandhi, the grandson of Indira Gandhi and the great-grandson of Jawaharlal Nehru. India's many regional and Dalit-based parties are an unknown factor and could come together to form a third block with the country's two Communist parties. One thing is certain, neither the Congress Party nor the BJP will be able to form a government on their own, and will necessarily build a coalition with regional parties. Whilst the BJP candidate Narendra Modi went to speak in the North-East, in Guwahati and Imphal, where he is less known, Rahul Gandhi started his campaign on Modi's home turf in Bardoli (Gujarat) by attacking the BJP candidate without ever mentioning his name. Modi wants to build a huge statue dedicated to Sardar Vallabhai Patel, the great Gujarat politician at the time of independence and in Nehru's first government (1947). Criticising Modi over his attempt to use Patel's legacy, Rahul Gandhi said that whilst the BJP leader might want to erect a statue to Sardar, after the assassination of the Mahatma Gandhi, Sardar outlawed the Rashtriya Swayamsevak Sangh (RSS or National Volunteers Organisation) because of its "poisonous ideology which will destroy India's soul". Modi, Gandhi added, has been a lifelong member of the group. In fact, as chief minister of Gujarat Narendra Modi has been accused of doing little to control the outbreak of violence that resulted in the deaths of 2,000 people, mostly Muslims, in 2002. Following that incident, the United States has denied Modi an entry visa. However, Modi has played up the mantra of economic development. Under his leadership, Gujarat has enjoyed extraordinary growth. "You sent a prime minister to Delhi for ten years, but what did the Congress Party do for the development of the North-East?" Modi said in Guwahati and Imphal, Assam, where outgoing Prime Minister Manmohan Singh has always held a safe seat. Yet, for political commentator Chetan Bhagat, the unmarried 40-year-old Rahul Gandhi could win by appealing to female voters. Chetan noted that Raul Gandhi mentioned "women empowerment" 25 times in a recent television interview. When it won 15 years ago, the BJP campaigned on the 'India shining' theme. Since then, India made huge strides in industrial growth, benefitting the urban population. A construction boom in Mumbai is transforming the city with futuristic buildings, but half a mile outside Greater Mumbai, there is no electricity for at least eight hours a day. Despite the economic development, benefits go to a small elite. In the last year, jobs have increased only 2 per cent, whilst 50 per cent of the workforce is still employed in agriculture. Traditionally, the BJP gets more votes in the cities, among the economic elite and Hindu militants, and is in favour of unbridled liberalization. The Congress Party is more populist, gets more votes in the villages and among the lower castes and religious minorities. Just ahead of the elections, it adopted a law that guarantees that everyone has access to fool. Under the Food Security Act, anyone with a ration card can buy a certain amount of rice, oil, sugar, kerosene, and more each month at controlled prices. The world economic crisis has reduced GDP growth from 8 per cent to 4.6 per cent during the Congress Party's two five-year mandates, a situation that will have consequences. In view of the pre-election climate, little progress has been made in the trial of two Italian marines, who have been held for two years at the Italian Embassy. An act of mercy or a compromise would be immediately considered a failure or interference on the part of Italian-born Sonia Gandhi, president of the Congress Party. Demand by Christian Dalits for access to government benefits for Hindu, Buddhist and Sikh Dalit would also be interpreted as favouritism on the part of Sonia Gandhi, who is a Christian. Suggestions have been made that, thanks to its sense of impunity, the Rashtriya Swayamsevak Sangh (RSS) has carried out occasional attacks against Christians impunity to embarrass the government and the Congress Party. 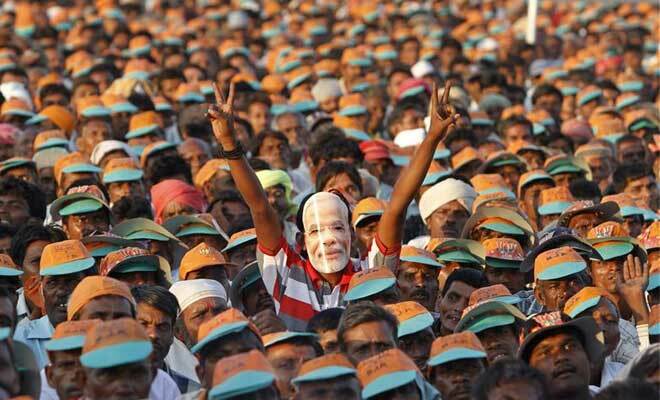 Feeling secure about Hindu voters, Narendra Modi has tried to reach out to other religious groups. After his trip to the North-East, one of India's most Christianised parts, he travelled to Kerala where he met with two archbishops of the Malankara Orthodox Church. Speaking to reporters after the meeting, Metropolitan Mar Athanasios, a former head of the Diocese of Ahmedabad, capital of Gujarat, praised Modi's development initiatives in Gujarat, adding that he would be happy if Modi became prime minister. Modi was expected to meet with representatives of other churches, but no one showed up. Jesuit Father Cedric Prakash, who lives in Ahmedabad, does not share the metropolitan's views. "I don't support any one party, but I am opposed to politicians who are corrupt, sectarian, and caste-oriented, especially if they criminalise society. When I think about Modi, I get scared, and anxious. Modi introduced an anti-conversion bill, and did precious little to stop the 2002 riots. He has also never apologised for the two thousand deaths that occurred."